Optional BIT 802E offers LAN control via web browser. Optimized for very low ripple, noise and temperature stability in current mode. Built-in isolation diodes for hot swap. Current share for N+1 redundancy. Up to 6KW in a 3U x 19" housing. 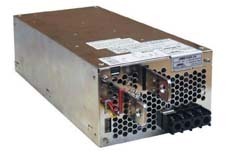 Up to 600 Watts in a 1U housing x 19" housing. 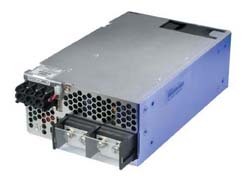 Series HSM is identical to HSP but without hot swap capability. Remote sensing (0.5V for 3.3 and 5V models, 0.8V for all others). Control/programming of voltage channel, current limit, overvoltage setpoint. 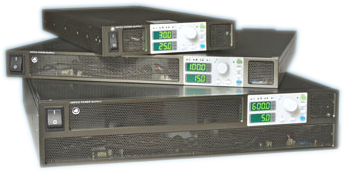 Set point monitors for voltage and current permit on-line adjustment of output limits. Switch selectable Bellcore-type current "walk-in" characteristic for battery charger applications. Front panel status indicators, duplicated by form C relay contact status flags at rear panel connector: POWER, DC FAIL, OVERTEMP, FAN FAIL. Safety Agency Approvals: Recognized component with SELV output per UL 1950, CSA 950, VDE IEC 950/EN 60950 for a-c mains operation. 5" x 5" crossection plug-ins meet EIA standard for 3U height. Fit three abreast in EIA standard 19" equipment racks (four abreast in 24" racks). HSP are fully protected for any overload including a short circuit. Remote control via one of two isolated TTL-level signals, one normally high and the other normally low. 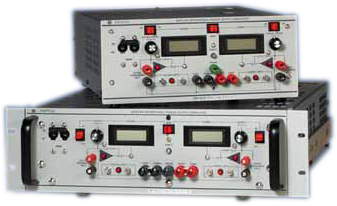 GPIB & isolated analog controls standard on all models. LAN control optional, replaces standard RS 232 interface. VXI plug&play, LabView and IVI-COM drivers. Control via web browser using LAN interface. True 1U height - full power operation with no spacing between units. 200-240V a-c input with active PFC. Wide range a-c input with active PFC. Semi F47 Compliant (high line a-c).